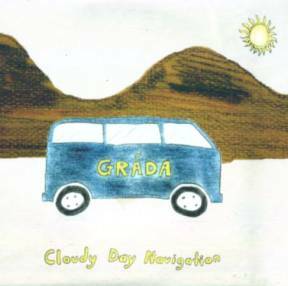 Every band, fully professional or otherwise, has its defining moment and Cloudy Day Navigation may well represent Gráda’s. It’s not just the musical development exhibited by the album over its predecessor The Landing Step, nor the presence of a new singer (in the shape of Galway’s Nicola Joyce, who also provides bodhrán and fiddle), nor the fact that the album comes accompanied by an excellent 6-track live DVD, nor Trevor Hutchinson’s absolutely apposite production, but a sense that this band has finally discovered its own musically well-defined environment and knows how best to undertake its exploration. True, the opening track, Sonny Condell’s Cooler at the Edge seems ready-made and pre-packed for Nicola’s uplifting vocals and includes a wiz of a fiddle solo from Colin Farrell and its successor, Twenty-One Foot Man, features a coruscating piece of flute improvisation from Alan Doherty, but the third piece in this triumvirate, Fifty-Ninth Street, marries delicacy and aggression in equal measure (would any other band even think of topping an instrumental workout with atmospheric harmonised vocals?). The impetus is maintained throughout the rest of the album which not only includes telling Gráda song compositions, such as Red Civic, as well as remarkably astute choices (Susan McKeown’s River – possibly Gráda’s coming of age song), but thoroughly gripping instrumental sets, such as Maria Letizia’s, all driven by the powerful duo of guitarist Gerry Paul and bassist Andrew Laking. Frankly, this is a band that has realized not only how to set out its stall, but one that also has achieved an understanding of its own potential (and the possibilities seem endless at this moment). A combination of instrumental and vocal prowess and well-honed improvisational skills augurs well for this quintet and illustrates just what Lúnasa might have become had the band ever elected to involve a singer or perhaps just been a little more daring. Gráda’s website is www.gradamusic.com or you can catch them at www.myspace.com/gradamusic. The Compass Records site is www.compassrecords.com.